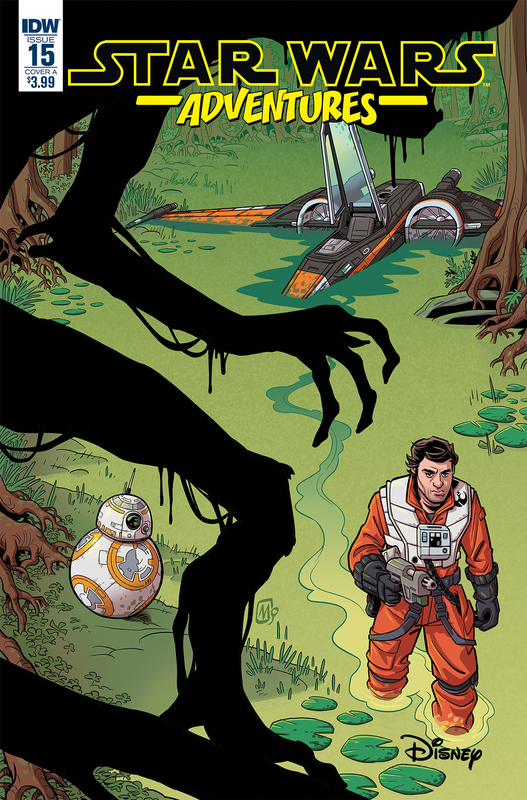 In “An Unlikely Friendship”, Poe and BB-8 make friends with a native boy who helps them survive the dangers of the swamp. While they don’t take the kid with them when they leave, they do give him hope that one day he’ll reach the stars. It’s a nice little story with some neat creatures. “The Planet of Misfit Droids” continues the Flight of the Falcon story as Bazine looks for the ship and follows more wild leads that aren’t of any help. This time a pair of mish-mashed droids tell her a story of how they once encountered the Falcon on Lotho minor. It’s an interesting little story with some really gorgeous artwork. It also teases where the next story will be heading. Overall, an okay issue. Both stories had some good artwork, but the second looked really good. It had a strong Disney style vibe to it with great attention to the characters and the coloring. I give this one a four out of five baby nexus.